A richly emotional landscape depicting the artist’s hometown dimly visible in the rain, which brought him into prominence. Ten years after giving up the idea of living in Tokyo in a state of despondency, in 1920, Kangan went to Tokyo again. His yearning for Tokyo and his dream to become an artist never ceased. However, his interest in Western-style painting had vanished completely and as soon as he got to Tokyo, he became a pupil of Suiun Komuro. From there, he began studying eagerly and grew little by little into an artist recognized by his teacher. This screen, together with Fine Evening (Ueno Kinen-kan), was submitted to the Nippon Nanga-in Exhibition and proved a memorable work for which Kangan received recommendation as a member of that institute. 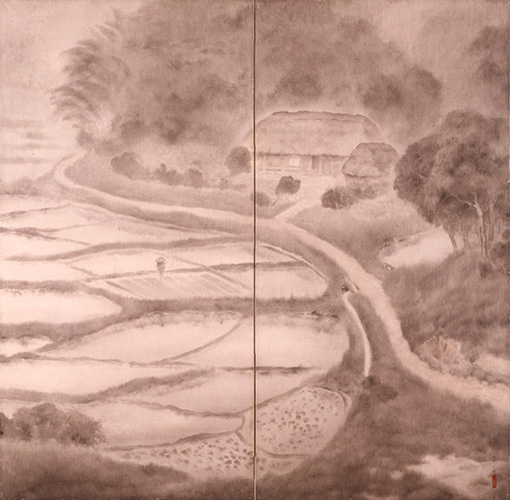 The subject matter is considered to be a farming village rich in nature in the artist’s hometown Kurobane. Kangan captures the faint landscape hazy in the rain in a superb way. Following Suiun’s teachings, Kangan eagerly incorporated realistic expressions in his nanga (literati painting), but it was not only realism. He also depicted a unique atmosphere that might be described as emotionality. Hereafter, Kangan continued to be active at Nihon Nanga-in.